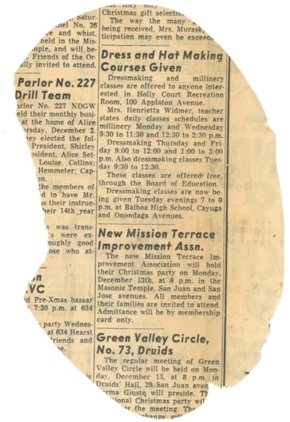 Click here for a more expansive history of the New Mission Terrace Improvement Association. much of the neighborhood was originally occupied by Islais Creek (often referred to as Cayuga Creek, and at one point known as Islais Swamp). Balboa Park / Ingleside Police Station, back in the day. One of the original trains crossed through the broccoli fields of Mission Terrace. Now Sgt. John V. Young Lane, the street that divides the baseball fields from the playground, pool, and soccer stadium, was once a dirt road lined by trees. Neighbors, David Hooper and Lisa Dunseth, are pushing for the Alemany Emergency Hospital and Health Center, to be designated a San Francisco landmark and hope to return the health facilities to their intended purposes.